Thirty-five years ago, the artist and writer Robert Morris posed a salient question: “If there is such a thing as public art, what then is private art?” It remains a key issue as art in the public realm takes on an ever more significant role in our heritage sites, urban spaces, parks and public plazas. Art in public spaces enriches our lives in various ways, in many places. It can send important messages to the community, make people more aware the environment, and let them see it in a different way. Art in public places, specifically those works which have been commissioned, should be considered as part of a much wider set of issues connecting planning, landscape and the environment. But here one begs to raise the question, what exactly can be deemed as a public space? British artist Mark Titchner also raises the question in a 2008 Guardian article titled “What’s the point of public art?” Titchner states, “One must also consider what we mean by the term ‘public space’, when much of what we have historically considered to be public space in cities is, in fact, shaded by private interest, in the form of sponsorship, advertising and private/public collaboration. This is also the case with virtually every museum or art institution in the world, and one must believe that these spaces should also be considered as public spaces. Following this, one must understand that the users of space constitute the greatest and most powerful force within the world of the public realm – everyone is a user of space. Consequently, the presence of a work of art in a public space – “our” space, “free” space perhaps – invites a feeling of ownership, of involvement of a very direct kind, where everyone maybe seen as a potential creator of that space. If people feel a strong sense of public ownership, then a sense of community is developed and strengthened. This need for community in cities is very important as most city dwellers suffer from, what I like to call urban disillusionment. This is the sense of not belonging to any particular place in the context of time and space as cities are rapidly growing and bursting forward without any thought of the consequences and people being left behind. When dealing with art in a public realm, most artists work with art as a medium for engaging the users of the space. Where architecture is sometimes seen as a mere background to our experience of the world and is noticed in a distracted way; somewhere on the periphery of our vision, art is meant to be something that catches the attention of the viewer, specifically in enclosed areas such museums and galleries, and hold them in thrall for a period of time. Public art, then in turn, is one in which the user of the space feels compelled to change his or her course to actively involve themselves in this aesthetic process, either as an observer or as a participant. Therefore, Public Art may be seen as a potential unifier of people, even if for a brief period of time as these displays of work in a sense “force” people to stop and interact with the places where we live, work and play. The works of art should be enjoyable; we should be cheered by what we see, perplexed perhaps, made curious certainly; a daily encounter should not become dull routine. And there is a deep reason why we respond to such objects and images as we do. It was the artist Michael Craig-Martin who observed “most space is undifferentiated. Once you have a sculpture there, you see the rest of the space differently.” He was talking about the impact of the Gormley figures on Crosby Beach, an art installation comprising of spectacular sculptures by Antony Gormley which were placed on Crosby beach in 2005 and are now a permanent installation on the site. Titled ‘Another Place’ the installation consists of 100 cast-iron, life-size figures taken from moulds of Gormley’s own body and spread out along three kilometres of the foreshore, stretching almost one kilometre out to sea. According to Antony Gormley, Another Place harnesses the ebb and flow of the tide to explore man’s relationship with nature. He explains: The seaside is a good place to do this. Here time is tested by tide, architecture by the elements and the prevalence of sky seems to question the earth’s substance. In this work human life is tested against planetary time. This sculpture exposes to light and time the nakedness of a particular and peculiar body. It is no hero, no ideal, just the industrially reproduced body of a middle-aged man trying to remain standing and trying to breathe, facing a horizon busy with ships moving materials and manufactured things around the planet. But Martin’s observations of Gormley’s work at the beach may apply to urban spaces as well – often featureless and undifferentiated just as strongly. In fact it may be observed that the impact of Gormley’s work may have resonated more with people when placed along the London skyline. “During the installation of EVENT HORIZON, it was great to see an individual or groups of people pointing at the horizon. This transfer of the stillness of sculpture to the stillness of an observer is exciting to me: reflexivity becoming shared. The conceit in all this is that in observing the works dispersed over the city viewers will discover that they are the centre of a concentrated field of silent witnesses; they are surrounded by art that is looking out at space and perhaps also at them. In that time the flow of daily life is momentarily stilled. 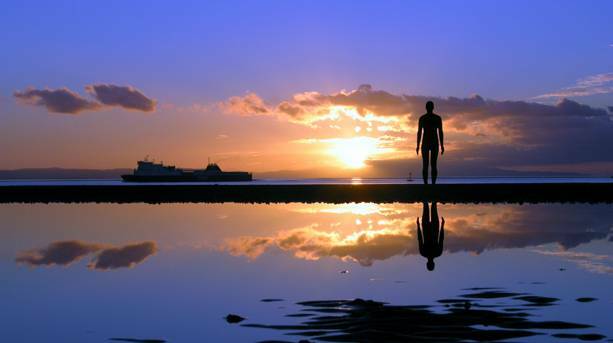 The beauty of Gormley’s sculptures are that they are ephemeral and not defined to anyone space or time. They have been placed around the world in Manhatten and Hong Kong as well, laying credence to the fact that the consumption of his art applies to mankind inhabiting cities on a global perspective, and that this human experience defies all boundaries of race, colour or culture. Lahore is a city which has existed for over a thousand years, if not more. Like all organic cities, it is one which has undergone a metamorphosis over the years, especially since Independence, and has changed both physically as well as socially. When one think of buildings and spaces, they frequently envision notions of permanence, stability and timelessness. But by examining the urban context, however, one finds the opposite. Urban space is a dynamic, rapidly reconfiguring milieu of information, people and construction, entirely codependent with time. It is the experience of moving around in the metropolis that creates the space and the relationships between things and people. Public art, thusly, maybe seen as a generator of by social relations by motions and by the spatial involvement of those who create it. 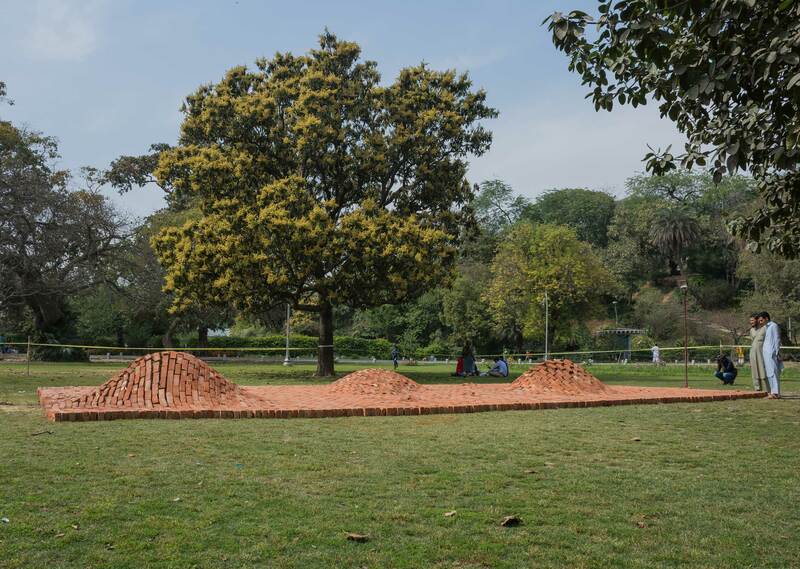 2018 saw the debut of the Lahore Biennale, an initiative many years in the making. Here, local and international artists formed collaborative ventures and engaged the city and its population in a number of sites which held great significance to the inhabitants of the city as it forced them to perceive the dearly loved and familiar spaces through various lenses. 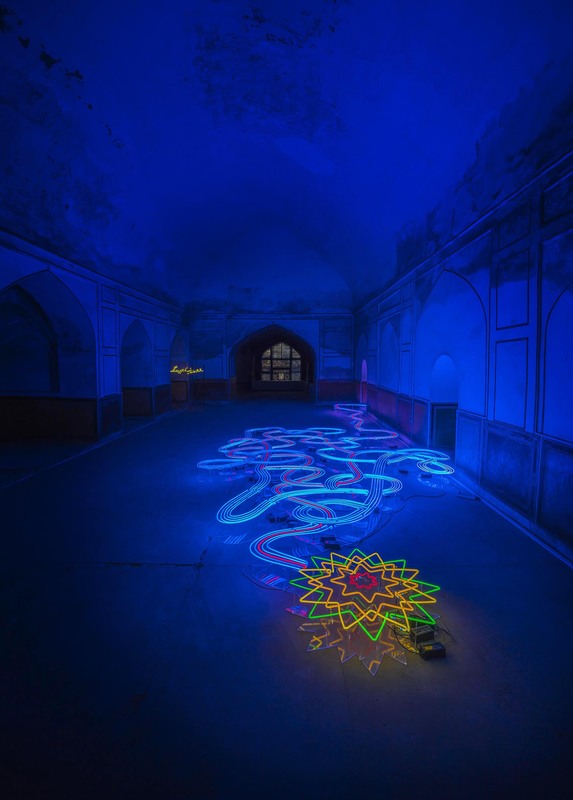 In the Lahore Museum, for as observed earlier these hallowed buildings are too considered to be public spaces, we saw the works of Waqas Khan, where the concept note for Khan’s large-scale minimalist drawings speaks of the depiction of webs and celestial expanses. Here, the contemplation of the self leaving visible evidence on paper is the crux of the work. 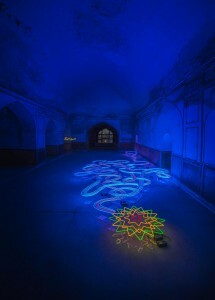 Khan employs small dashes and minuscule dots to create large entanglements. Where when two particle-sque units are spread out and entangled, they are essentially ‘in sync’ with each other, and they’ll stay in sync no matter how far apart they are. This idea of togetherness and being seen one as a magnanimous totality is what he partly absorbs from his inclination towards literature and interest in the lives of sufi poets. 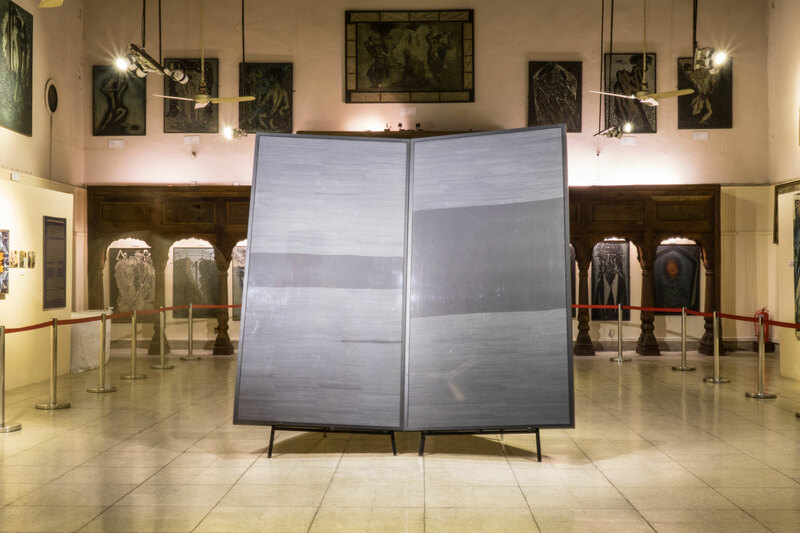 The city of Lahore has always provided a setting for such creative efforts to flourish and thrive, and the Biennale as an event also afforded the people of the city to see the spaces they inhabit differently. It is an extraordinary quality, a remarkable opportunity and a huge prize for anyone commissioning as well as creating public art, for it can achieve something that not many other endeavours can… tapping into the continuing potency of art at its most dynamic level, while being ultimately the most rewarding for the artists themselves.